When cells break away from a primary tumor and migrate through the body to a new location where one or more new tumors begin to form, the process known as metastasis has occurred. Generally, cancer cells are distributed in this way via the circulatory system or the closely associated lymphatic system. Since all blood flows through the lungs, pulmonary metastases are very common. Approximately 30 percent of all metastatic cancers involve one or more secondary tumors in the lungs. 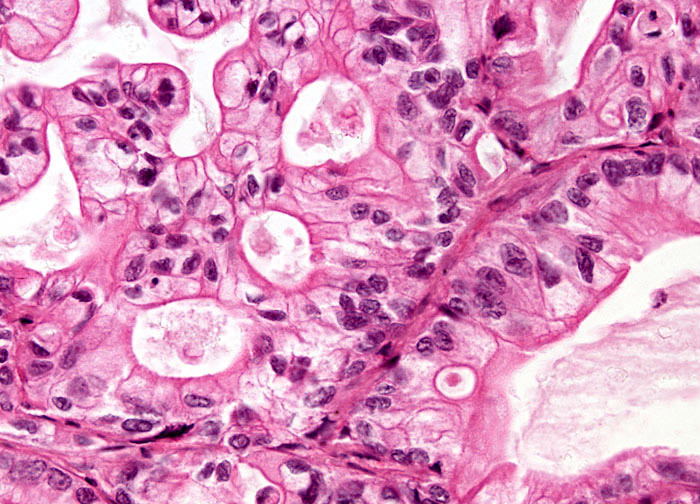 In fact, cancer in the lungs is more often metastatic disease rather than a primary neoplasm. Some of the most common cancers that lead to secondary pulmonary tumors are breast, stomach, prostate, thyroid, colorectal, and kidney cancers, testicular teratomas, bone sarcomas, choriocarcinomas, and melanomas.